Wythenshawe Community Housing Group (WCHG) are delighted to announce that their flagship Extra Care Scheme Village 135, won the ‘Best Independent Living Scheme’ category at the Pinders Healthcare & Design Awards 2018, at a prestigious ceremony in London, March 14th. The Awards, aim to promote and recognise the very best developments in all types of care-related property developments, whilst the award categories seek to acknowledge the contribution made by home owners, designers and architects to the well-being and quality of life for those in their care. ‘Village 135’ is a development for the Over 55’s that takes extra care to the next level. 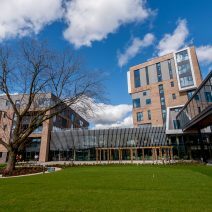 This state of the art facility opened in June 2017, offers 135 luxury apartments for the Wythenshawe community with fantastic onsite facilities including a Bistro, Spa, Hair Salon and extensive landscaped sensory gardens. Village 135 is a flagship development that has been recognised on a national level as a market leader in the extra care industry. It provides a bespoke 24 hour care service for residents existing and ongoing needs.